» Not a member? Sign up! SPEAKERS' NEST is a hosted service tailored to manage conferences, meetings and events of all sizes, without the need for designers or programmers. 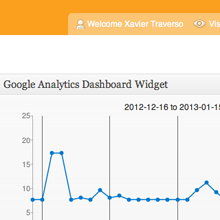 It provides your event with a strong web presence and the best tools to service your sponsors, speakers and attendants. Setup your site, schedule your program, open up for registrations and start selling tickets right away! Get a professionally looking website powered by the leading content management system on the web. Choose among a set of beautiful skins and enjoy a mobile-ready web presence. You don't need any coding experience and you don't have to worry about hosting plans, installs, upgrades or backups. We take care of everything. 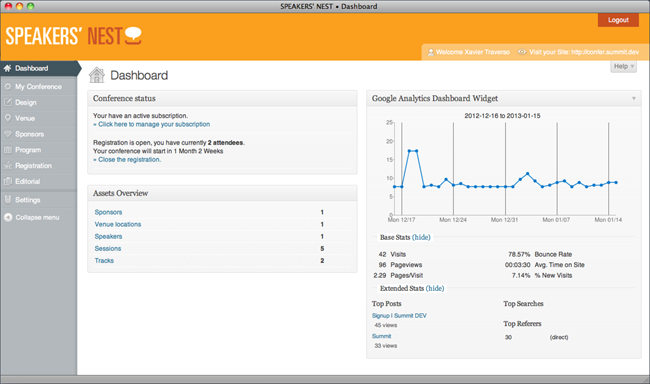 SPEAKERS' NEST is a hosted solution, your site is securely powered by our speedy network. Create sponsorships programs, relate sponsors to locations, tracks, sessions or speakers. 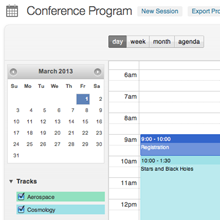 Manage conference sessions and create single or multiple track programs by drag-and-dropping slots in a calendar view. 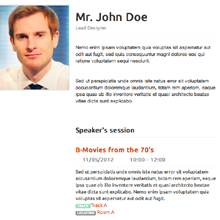 Assign sessions to locations and edit your speaker's profile. 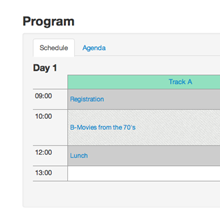 Attendants will be able to import your program directly into their calendar. 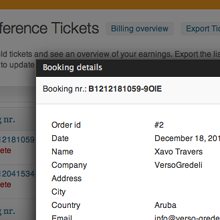 Allow your attendants to register directly at your site, and collect payments. Customize the registration form and collect the exact information you need. 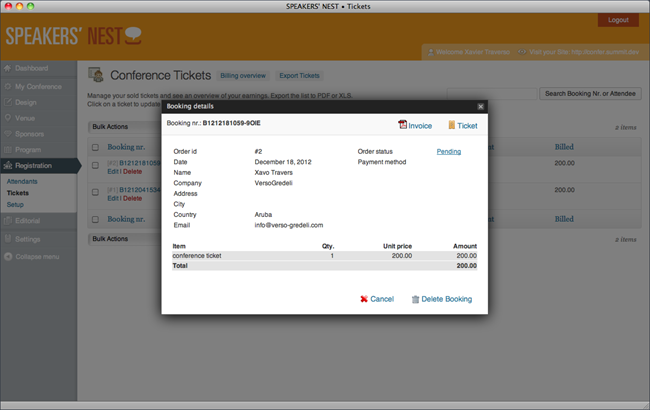 Our flexible ticketing system supports early birds and coupons discounts. Your attendants receive PDF tickets with QR Codes ready to be scanned at the front door. SPEAKERS' NEST has a simple price structure. Pay as you go, only 99$ per month. Or purchase a year for 999$ and get two months for free. Either way you get access to the fully featured product for any size of conference. Our service includes highly secure hosting and dedicated customer support. Start out today with a 15 day free trial, no strings attached. What features/services does SPEAKERS’ NEST provide? Sign up and use SPEAKERS’ NEST for free for 15 days. If you decide to cancel during your first 15 days, you won’t be charged a dime. Danish Standards is the national standardization organization of Denmark. 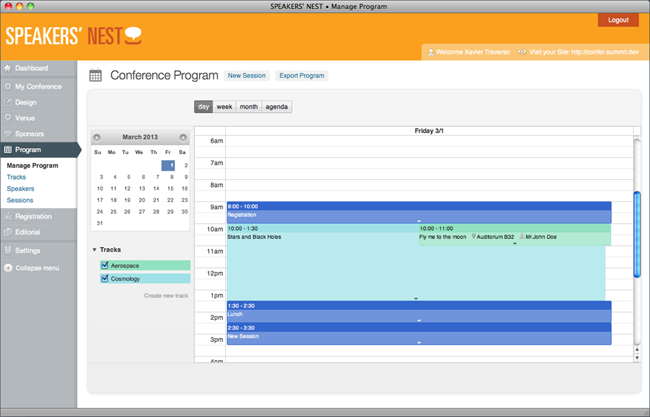 With responsibility for more than 200 standardization committees they use SpeakersNest to arrange and organize meetings and events. We strive to improve our software based on feedback from quality conscious organizations like DS. 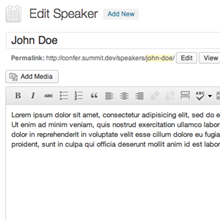 SPEAKERS' NEST is a WordPress based tool developed by the company Verso & Gredeli. 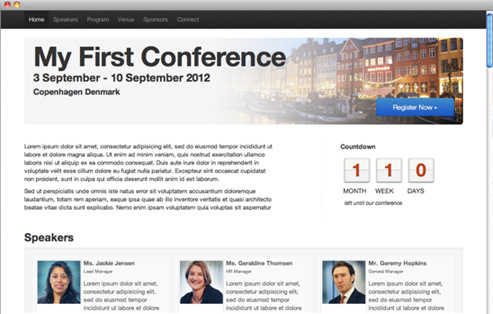 We are a small newly established software company based in Copenhagen, Denmark. 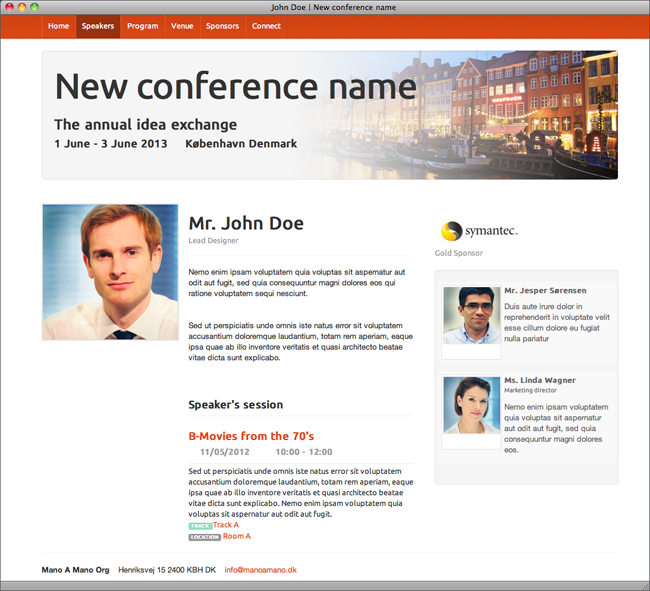 Our vision is to create innovative, affordable and easy-to-use software allowing our customers to design and manage their own conferences without the use of expensive and time-consuming consultants and programmers. Feel free to contact us with comments or questions. 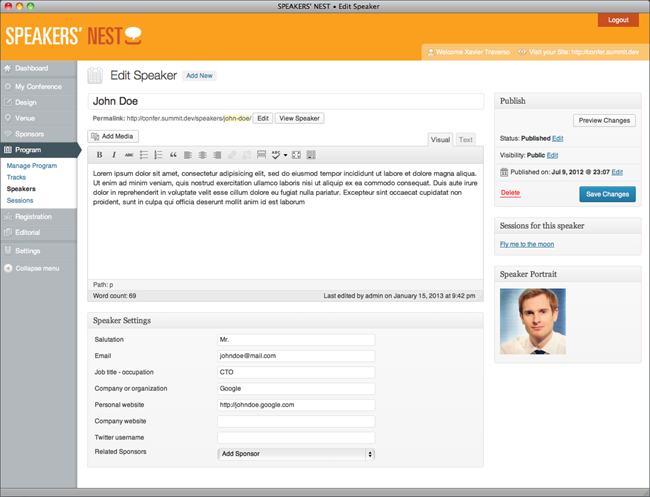 SPEAKERS’ NEST is based on the Wordpress platform, one of the world’s leading easy-to-use Content Mangement Systems. As our hosting service we use WP Engine, highly specialized in secure hosting, backup and support of WordPress based sites.